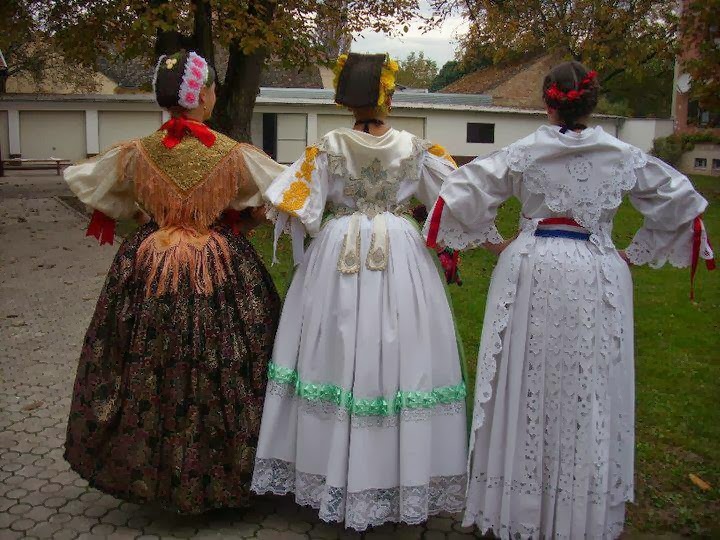 Today I will continue with the Croatian costumes of eastern Pannonia. 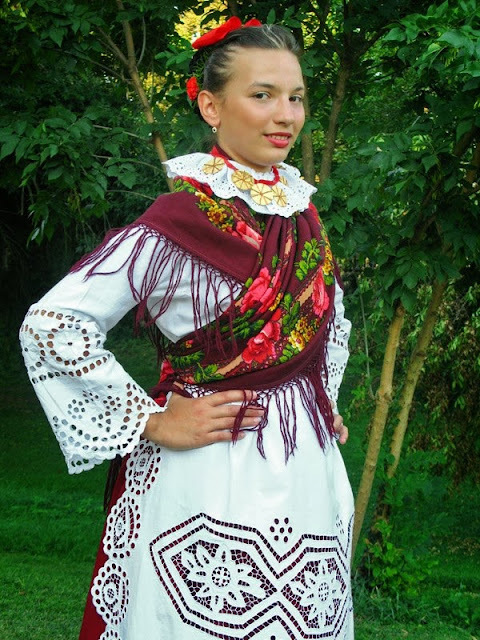 Most of this region is called Slavonia, but there are variations in the costume of various areas. 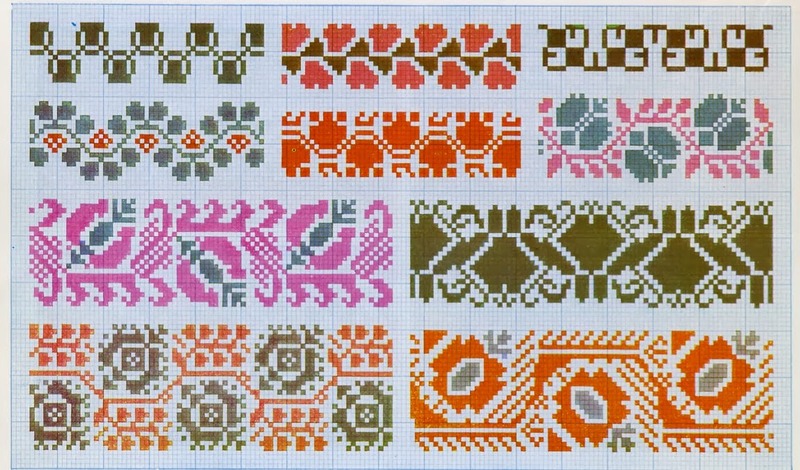 Here are our two maps again. 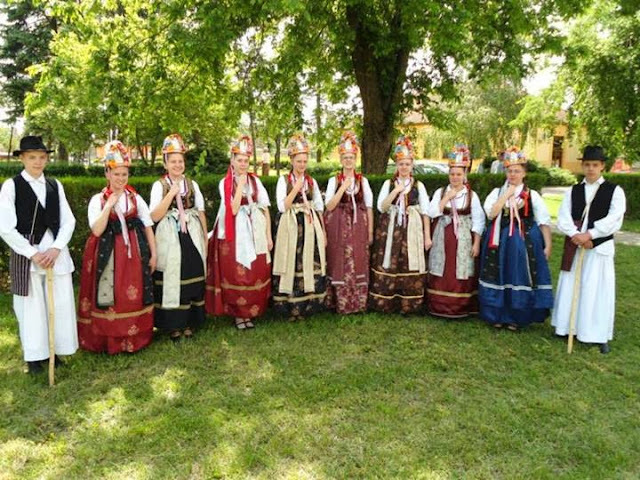 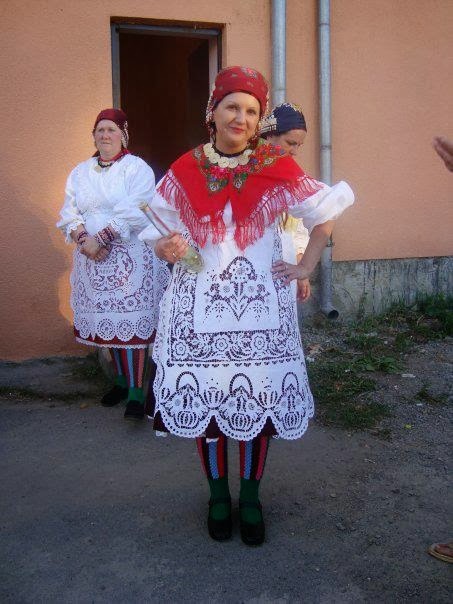 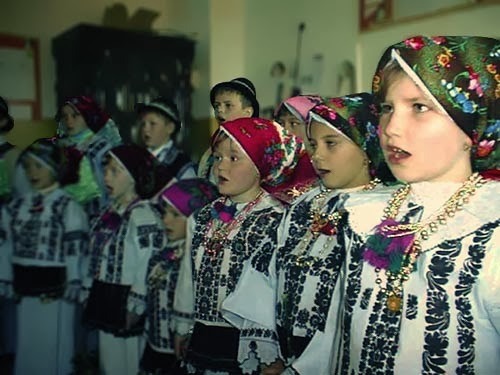 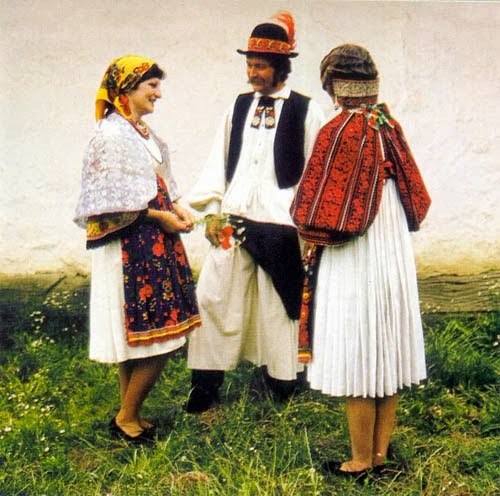 The photo above shows one of the typical Slavonian costumes common in southern Slavonia. 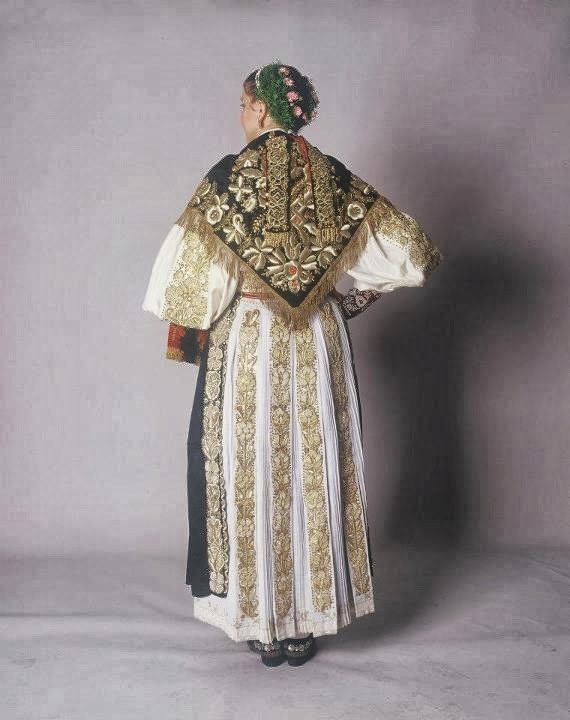 It is similar to the Posavina costume, but instead of having a broad band of embroidery around the hem, it has several embroidered stripes down the back of the skirt, and smaller pleats in between. 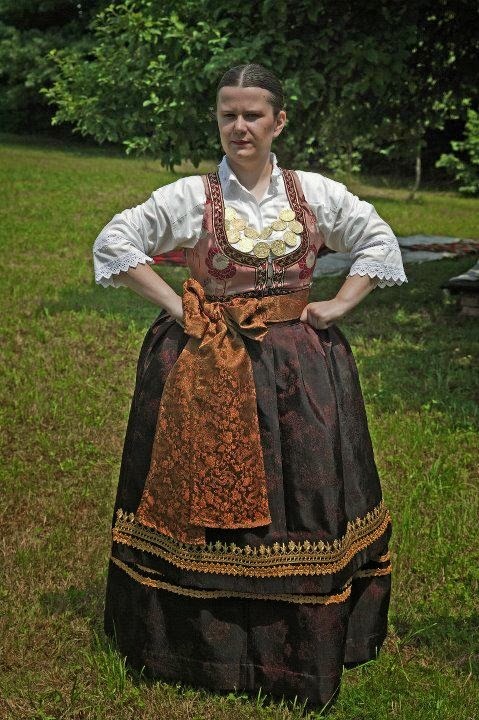 This might be called the 'villagy' version. 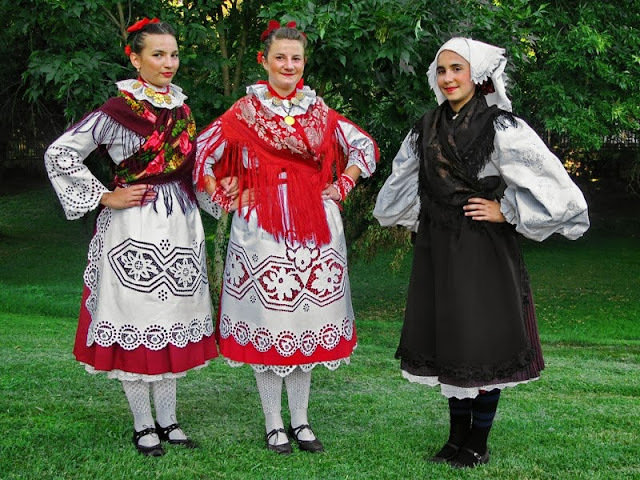 The embroidery is usually red and/or black., although, as you can see from the image above, it can also be burgundy. The embroidery is usually repeated simple motifs, like these, although I have never seen pink used, and, of course, the stripes are done vertically. 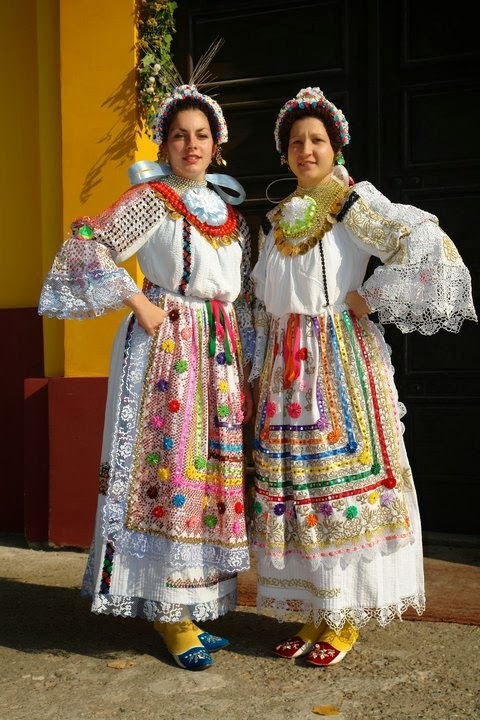 These designs are often done in heavy yarn so as to be somewhat three-dimensional, as you can see, commonly some of the same embroidery is done on the blouse, and a relatively narrow stripe is also commonly done above the hem. 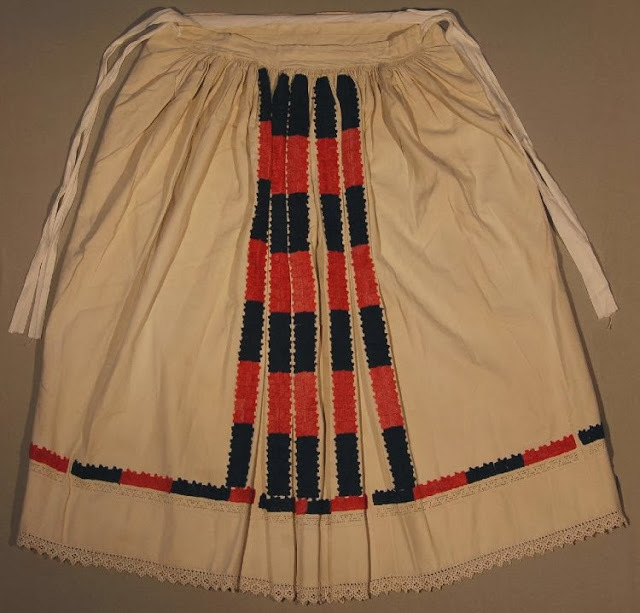 The apron is sometimes linen, as here, but more commonly is of a heavy tapestry material with fringed edges. 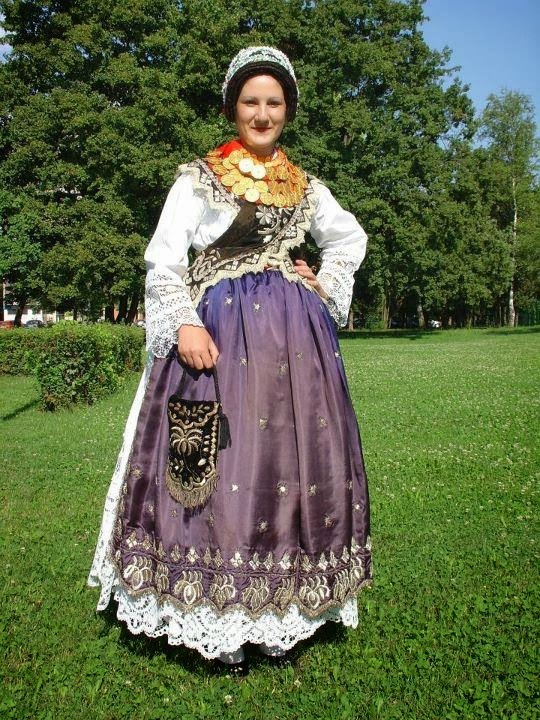 This is often tucked up so that it hangs at an angle. 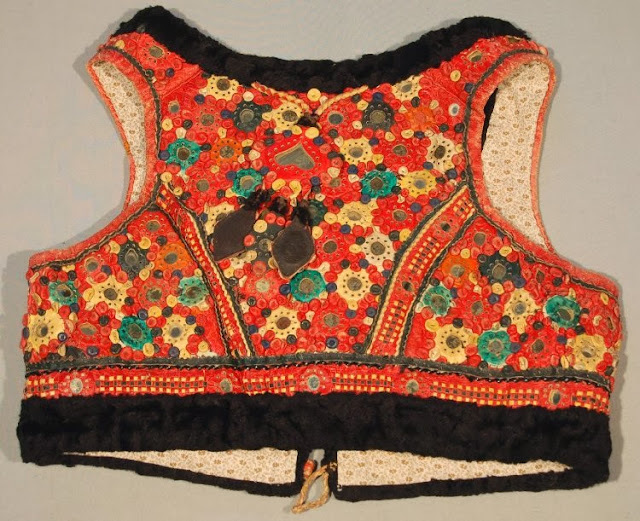 The vest is of sheepskin, with a geat deal of applique which incorporates small mirrors. 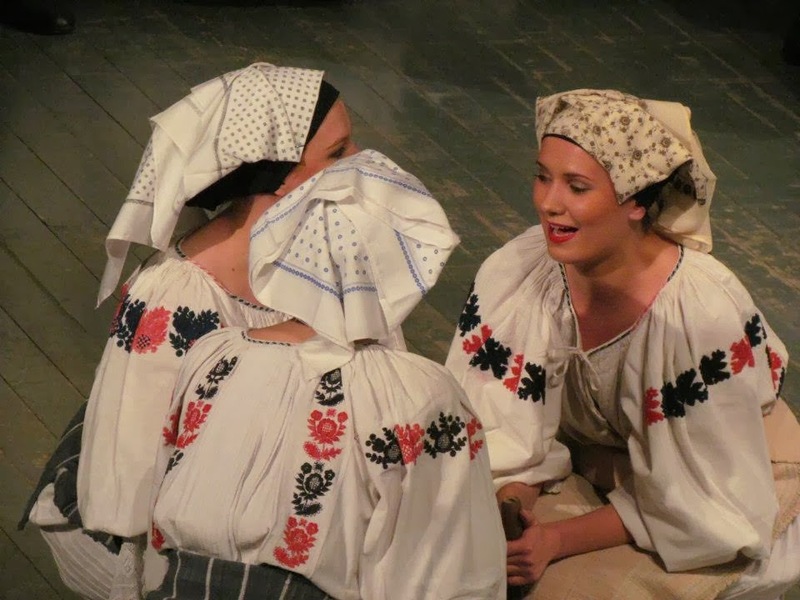 Because this area is very fertile, the peasants are relatively well off. 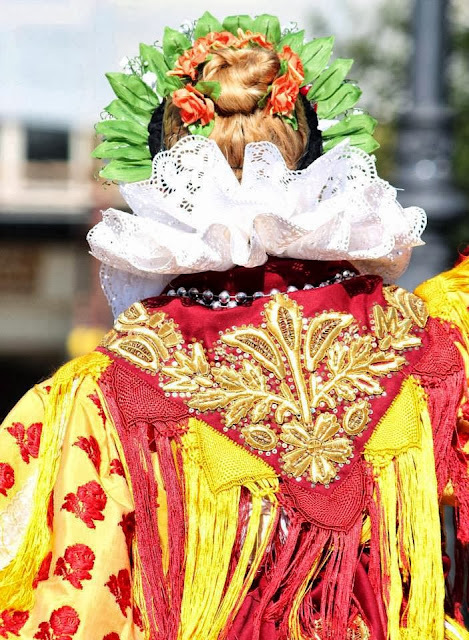 This became reflected in the costume. 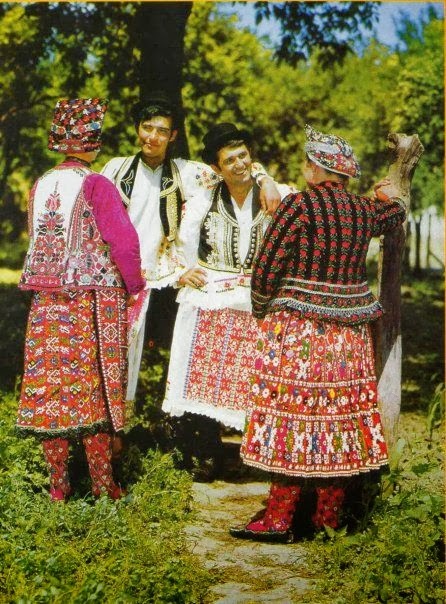 In some places, the red and black cotton or linen embroidery became replaced with polychrome floral embroidery in silk. 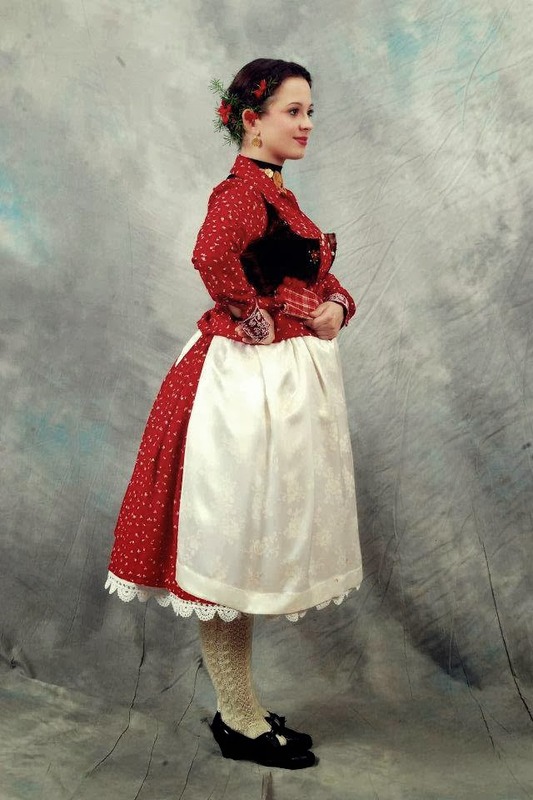 The aprons to match this became satin or taffeta. 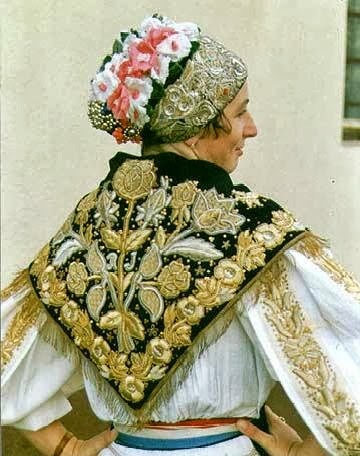 Another version of the costume is restricted to linen, but the embroidery becomes all white, with abundant lace and openwork. 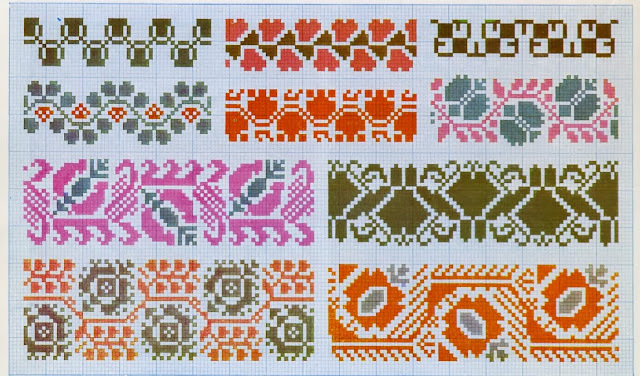 The effect of this can be simple, or quite rich and elegant. 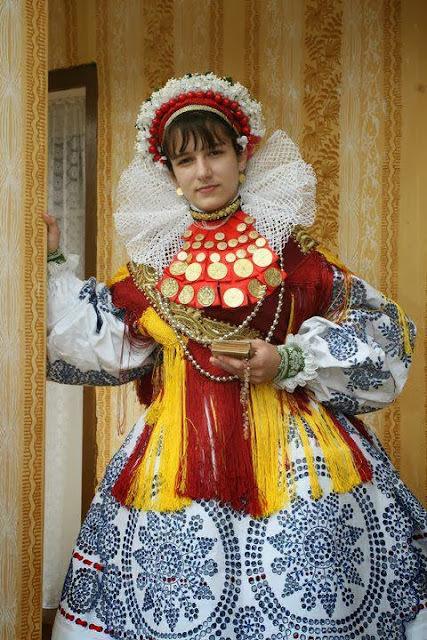 Yet another, still richer variant exists, especially around Djakovo. 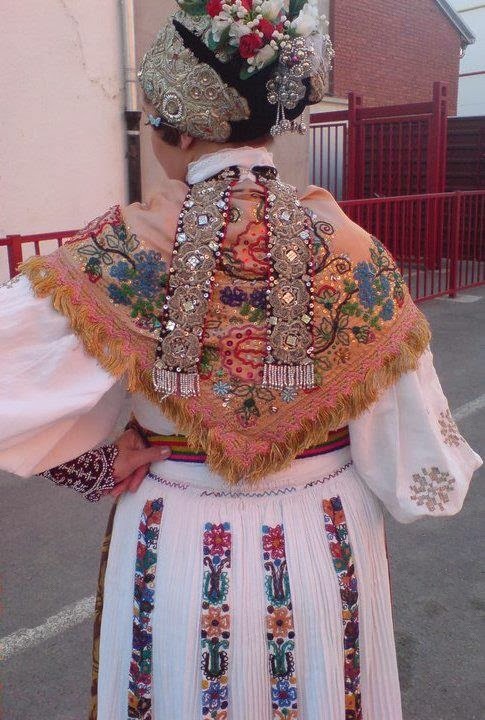 This has the embroidery all done in gold and silver metallic thread. 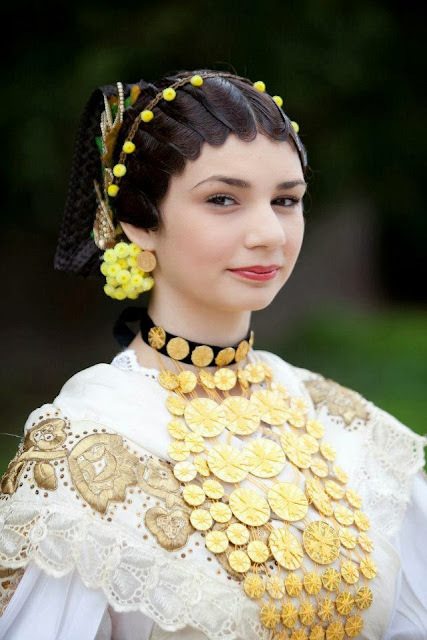 A remarkable number of gold coins are used on ribbons around the neck. 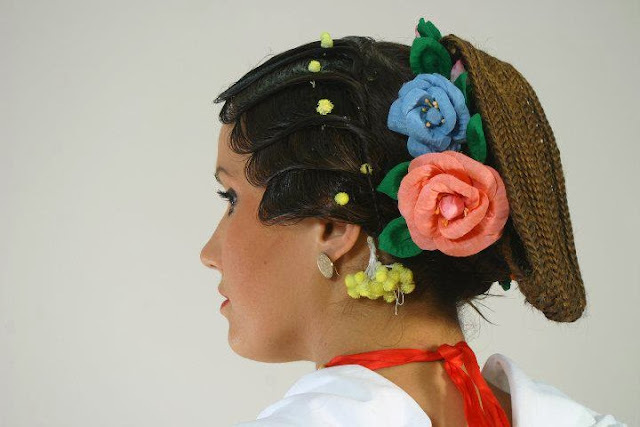 Also a number of very complex hairstyles are worn with this costume. For cooler weather, sometimes the linen itself is replaced with silk. 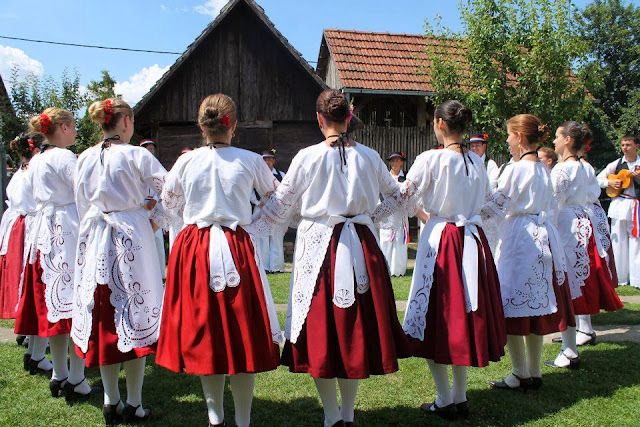 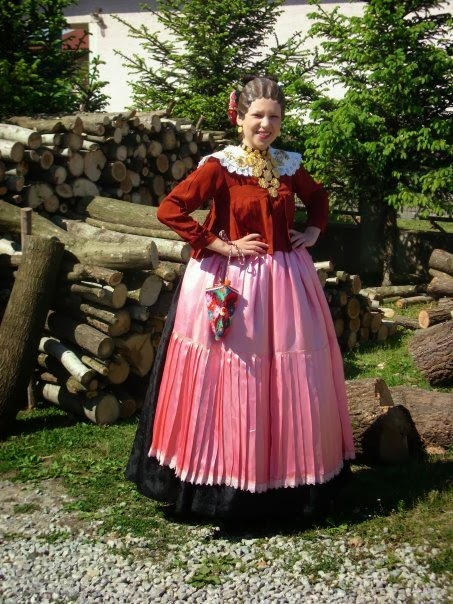 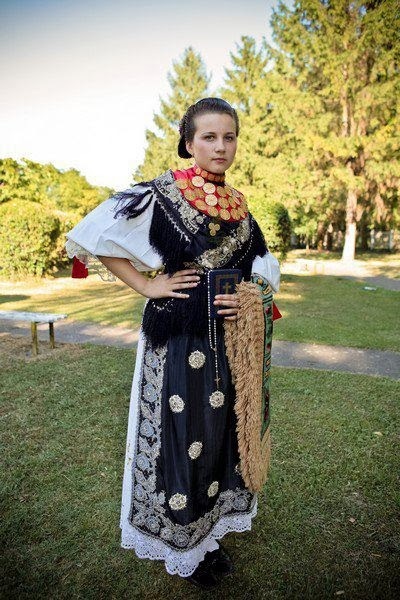 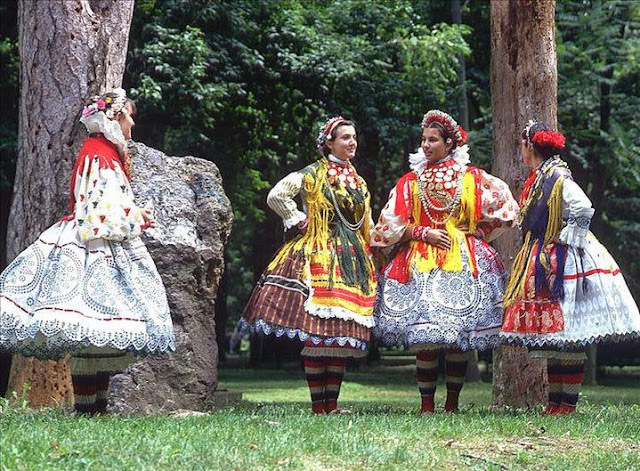 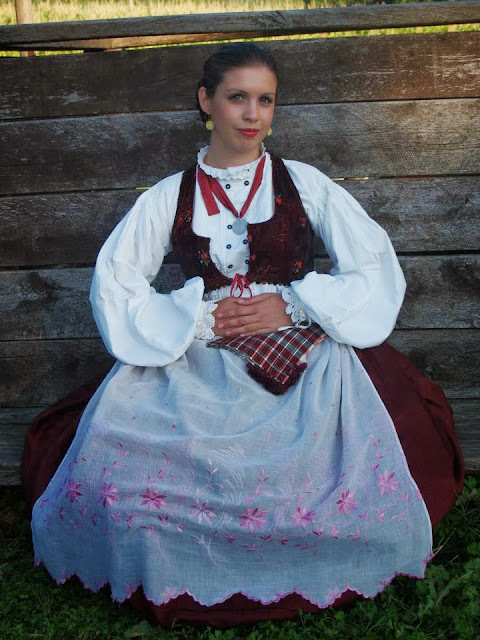 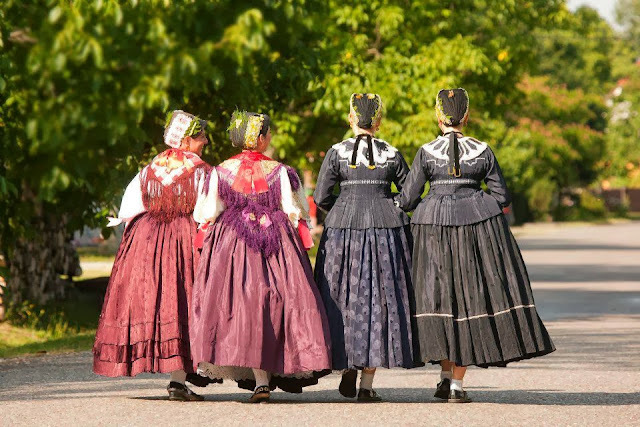 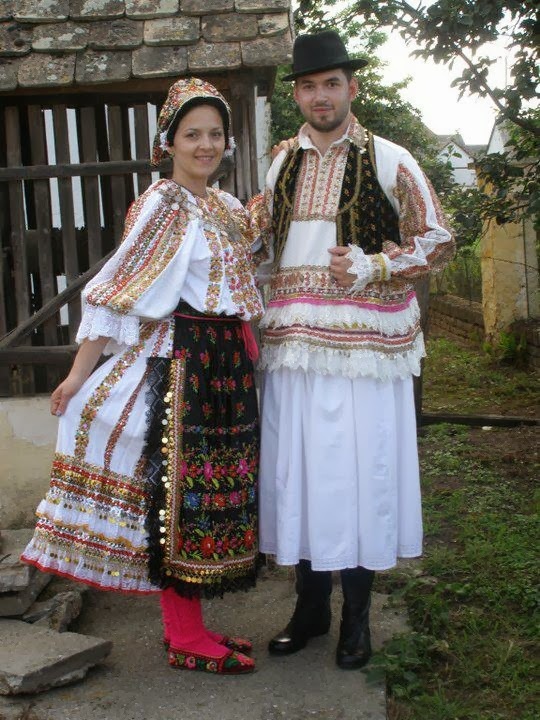 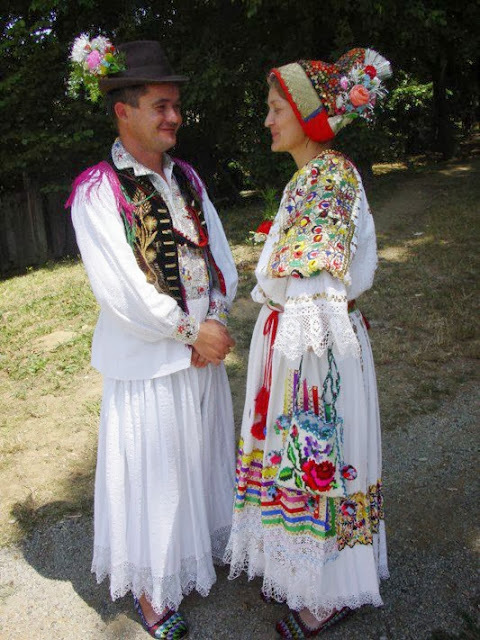 In northern Slavonia, the skirts in general tend to be shorter, especially near the Drava river. Also with the same general type of costume, the village of Nard. Somewhat to the southeast of this area is found what has to be the most flamboyantly extravagant costume of Slavonija. 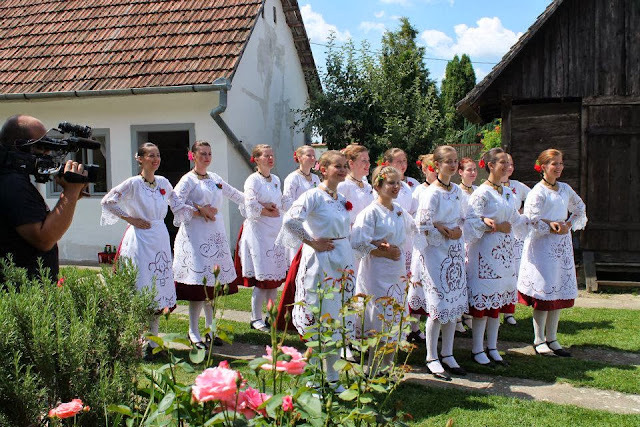 This is centered on the villages of Bizovac and Brodjanci. 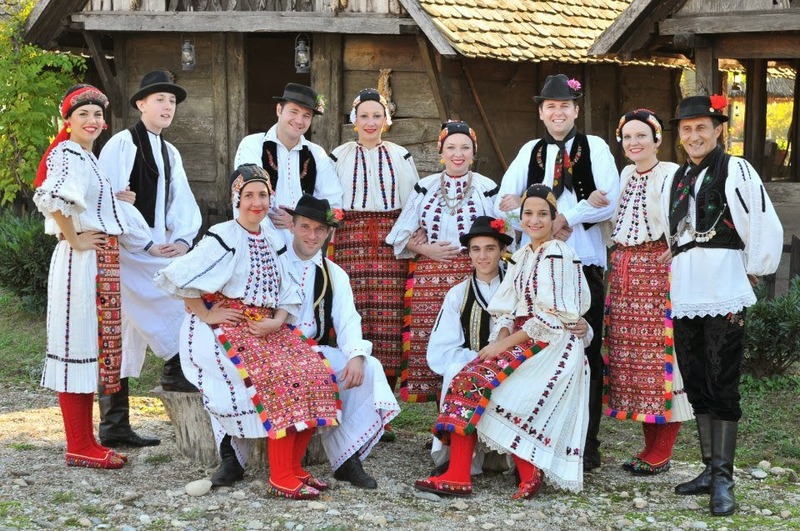 North of the Drava river is the region of Baranja. 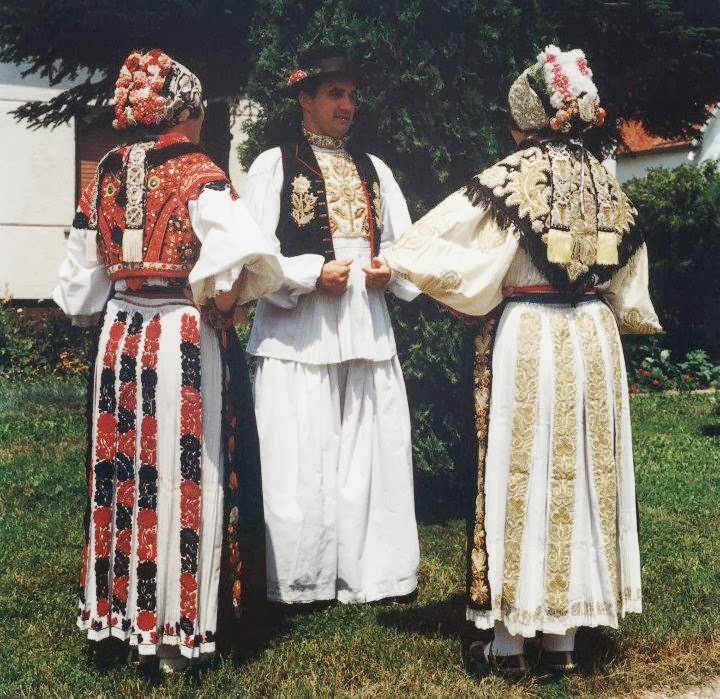 This is a triangle bordered on the northwest by Hungary and on the east by the Danube river, which forms the border with Vojvodina. 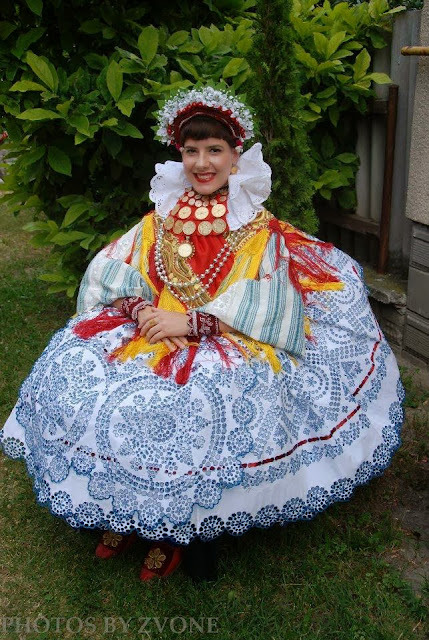 The costume is similar to that of Slavonija, but is distinct. 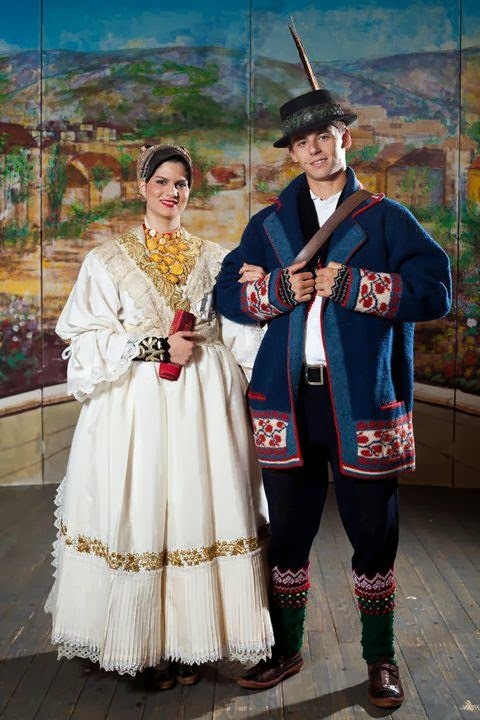 Hungarian influence is also evident. 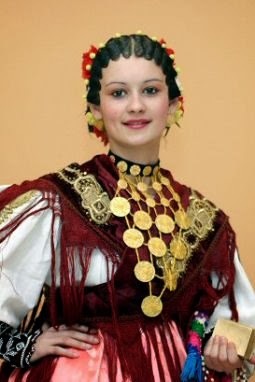 I should add that some portion of the population in this area is Serbian, but the costume is very similar. 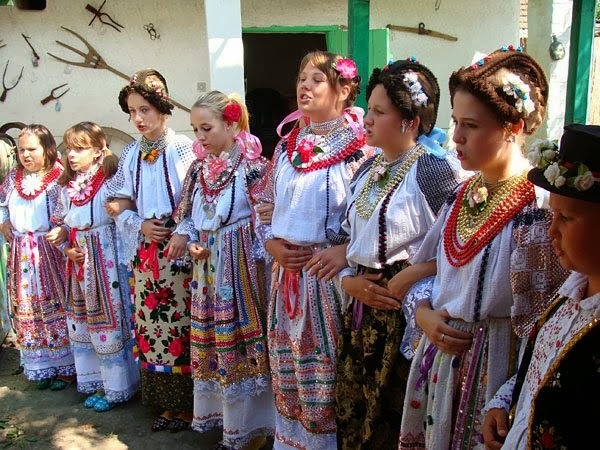 Between where the Danube turns to flow eastward and the Sava river is the region of Srijem [Srem]. A small part of this in Croatia, but most is in Vojvodina. 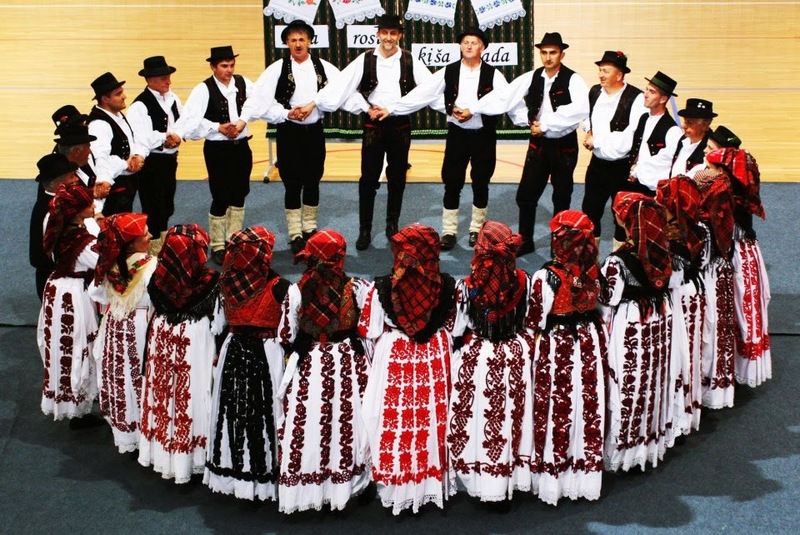 Vojvodina is an autonomous region within Serbia. Many Serbs live there, but also many Croats, Romanians, Hungarians, Slovaks, Romany, Rusyns, and others. There is no one nationality which is in the majority. 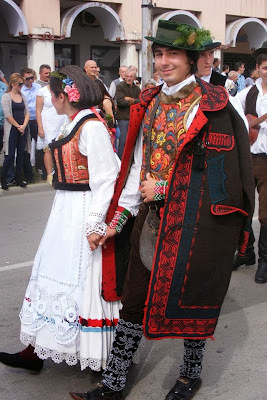 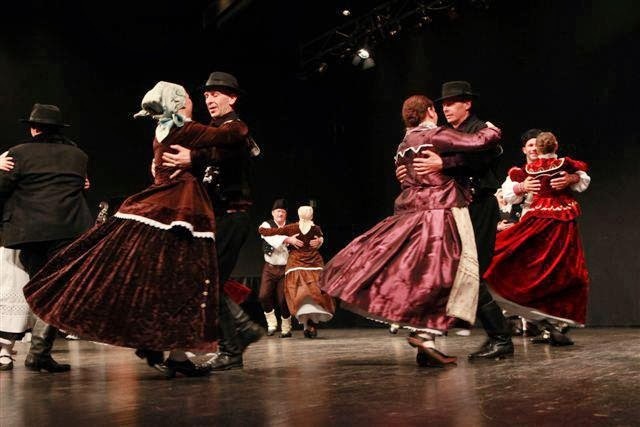 The costume of the Croatians in Srijem greatly resembles that of southern Slavonia. 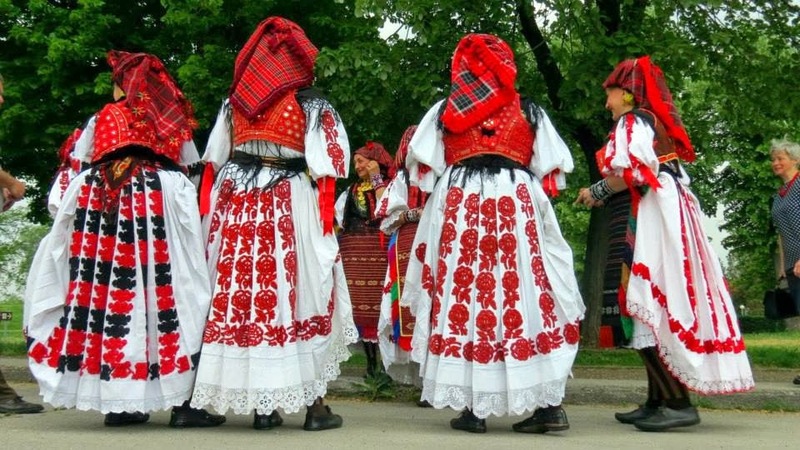 North of the Danube is the region of Bačka, still within Vojvodina. 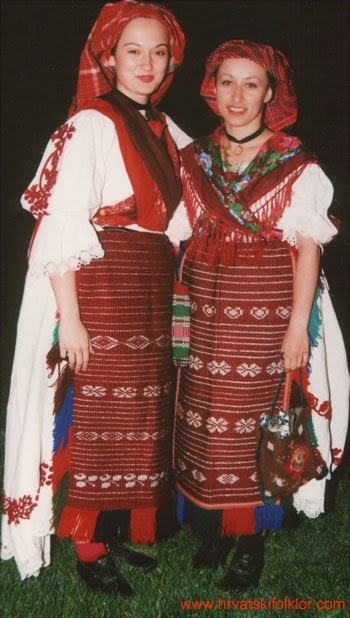 Šokci and Bunjevci, each of which migrated to this area separately quite a long time ago. 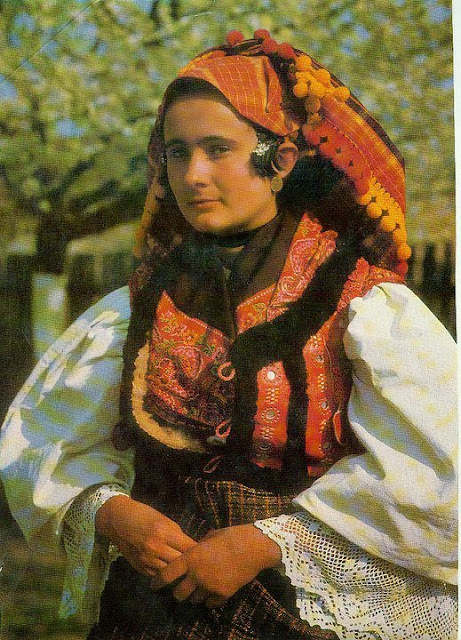 The Šokci possibly from around Srebrenica in Bosnia, the Bunjevci likely from Hercegovina. 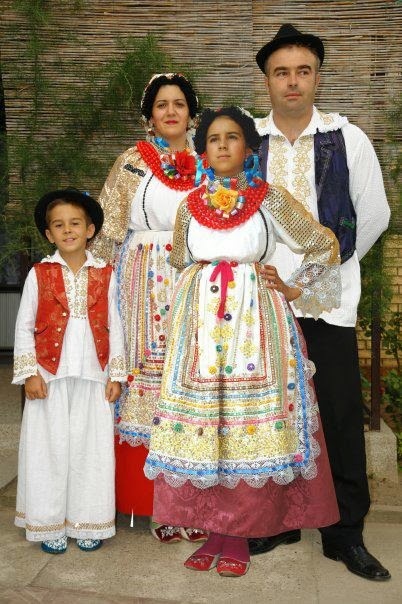 These people also live just over the border in Hungary. 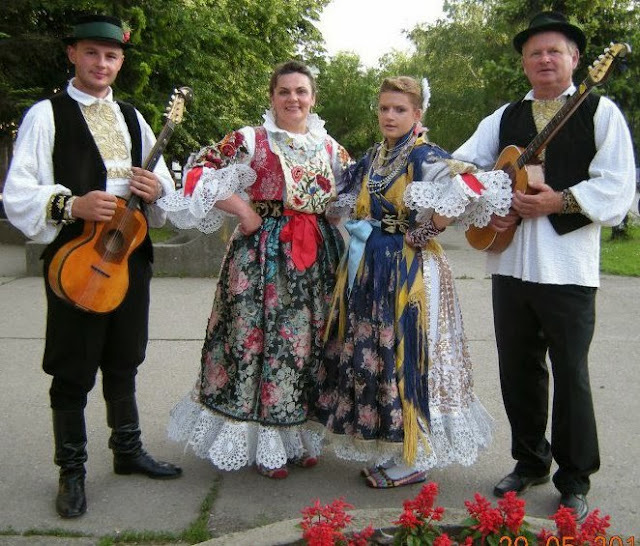 East of Bačka and Srijem, across the Tisa [Tisza] river is the region of Banat. 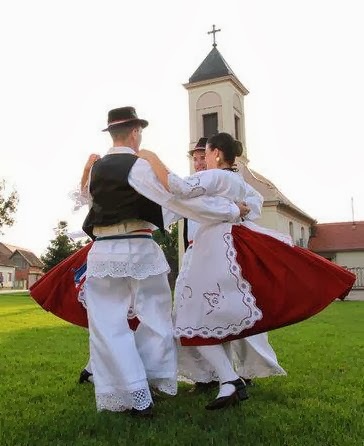 This is currently split between Vojvodina and Romania.There are some communities of Croatians in Vojvodinian Banat. 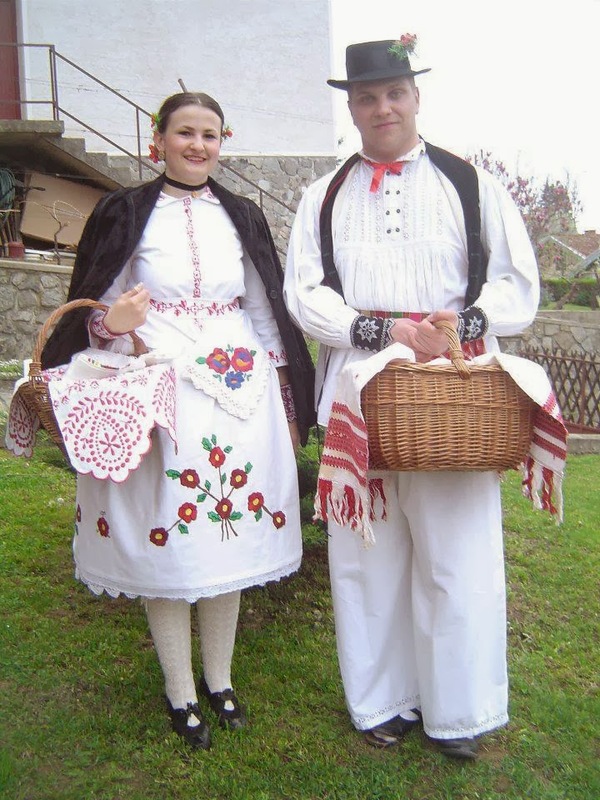 The costume does not differ much from the Serbs in the immediate vicinity. 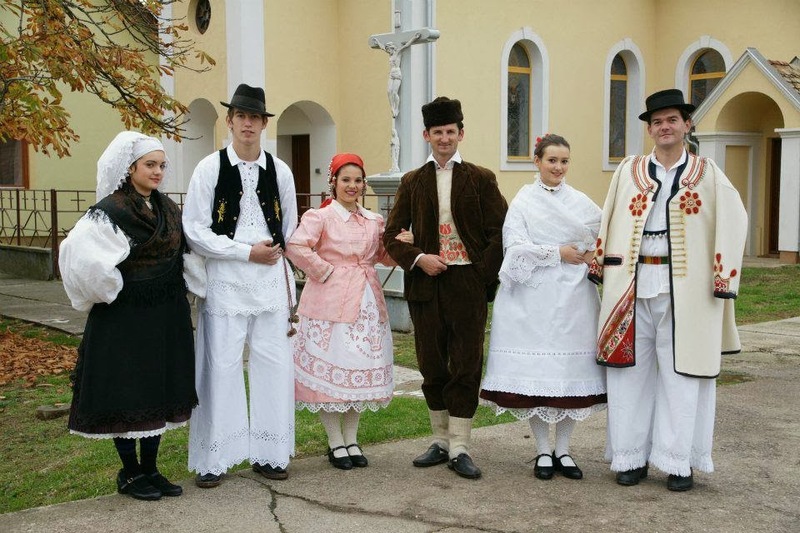 There are two groups of Croatians which are found even further east, in the Romanian Banat. 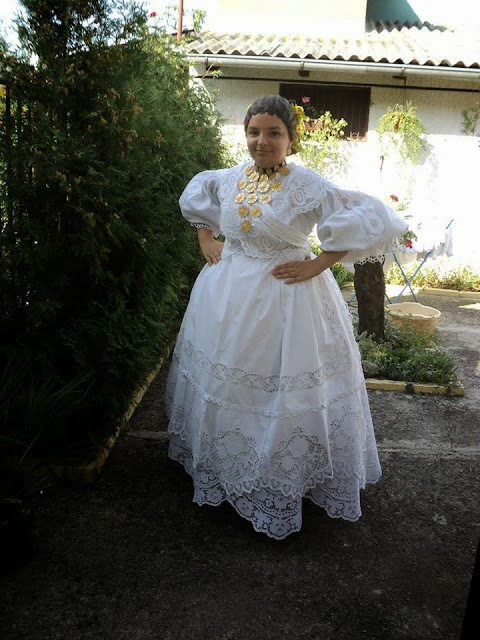 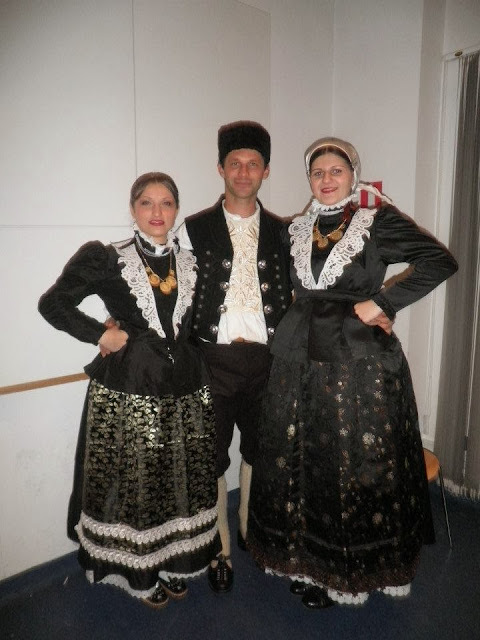 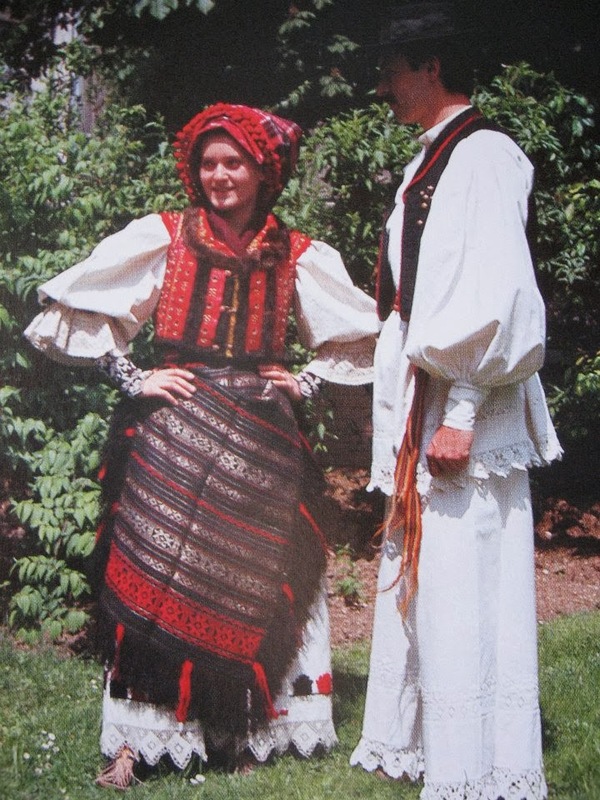 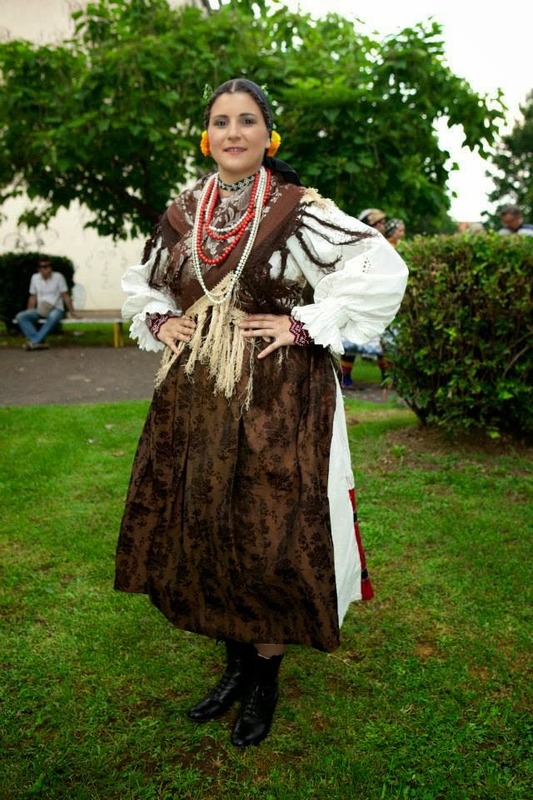 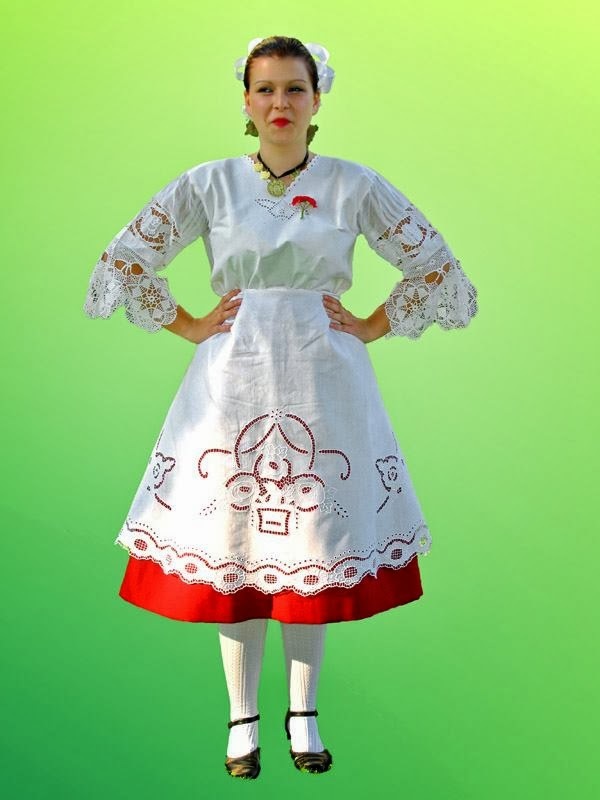 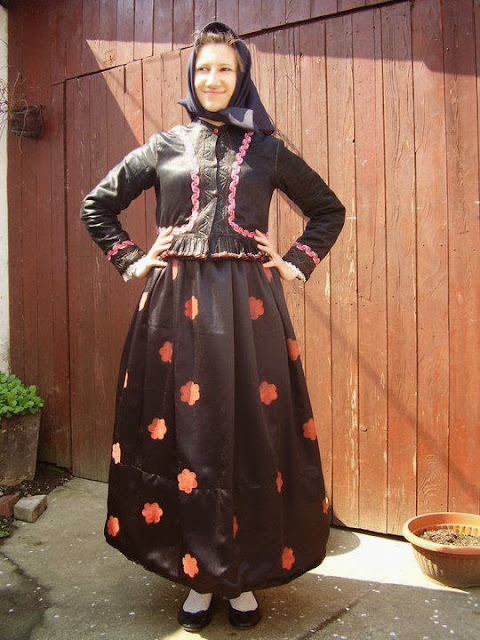 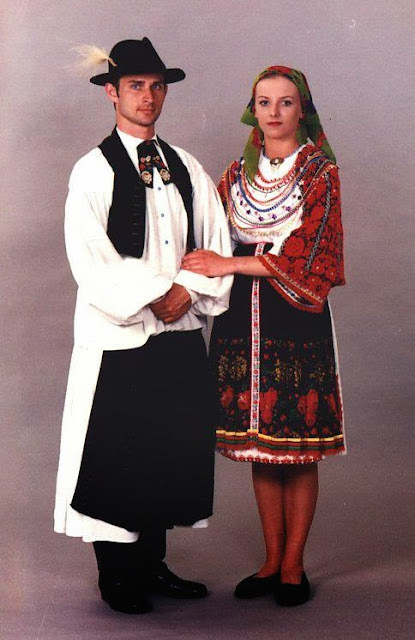 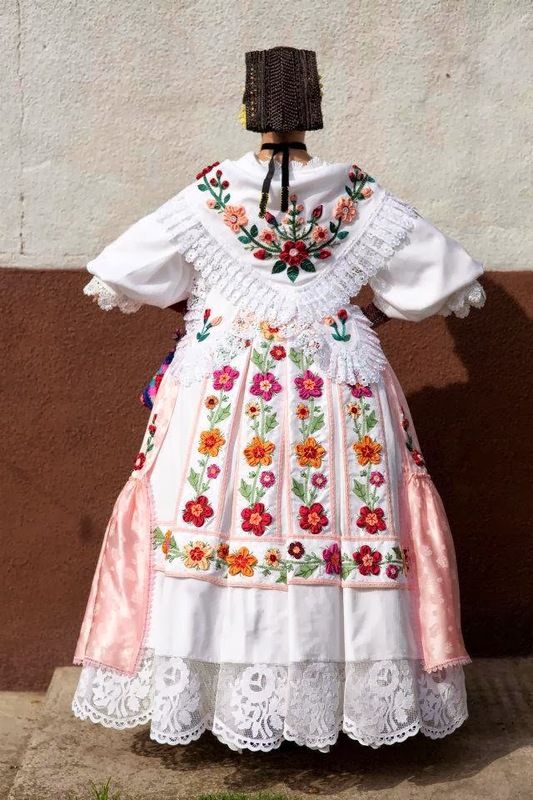 This costume has some similarity to others in Slavonia and elsewhere, but also some features in common with the Swabian community in the Romanian Banat. 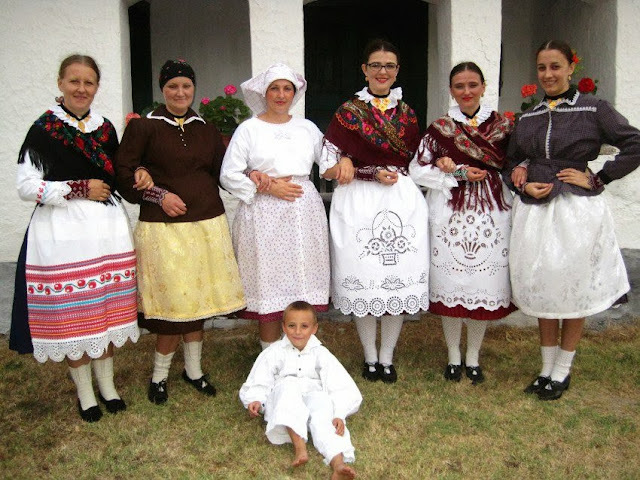 The origin of this group is a bit murky, since, although they are Roman Catholic and self-identify as Croatians, they speak a Torlakian dialect which would have originated somewhere in the Serbian/Bulgarian border region. 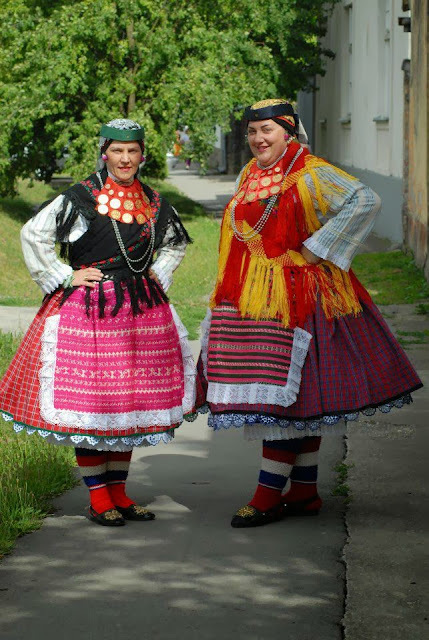 Likely they come from two different groups which have fused. 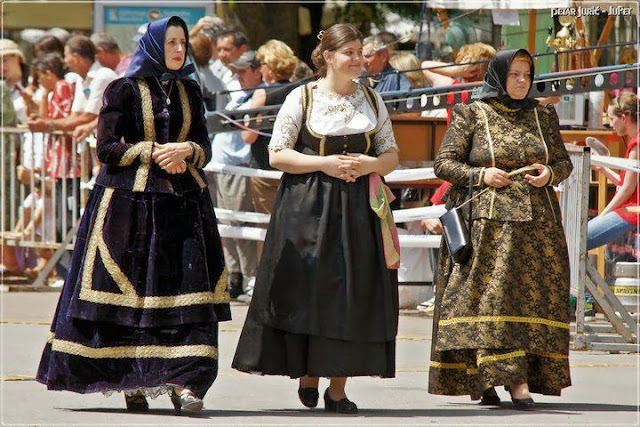 In any case, they have a very unusual and interesting costume. 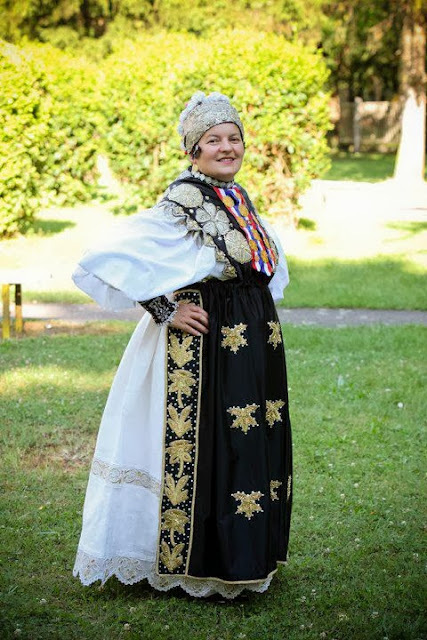 There is a facebook page with a lot of information and high quality photographs: 'Croatian Traditional Costume' which I highly recommend. 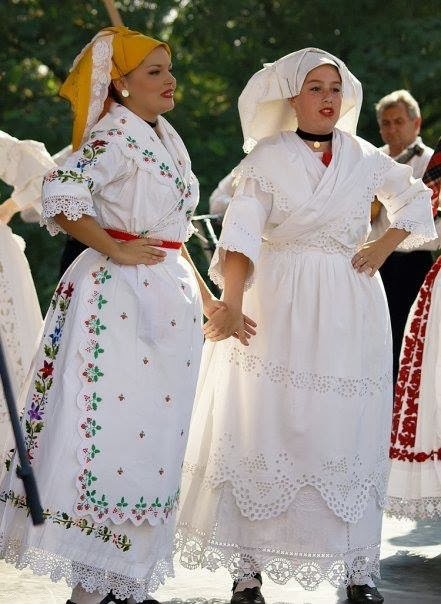 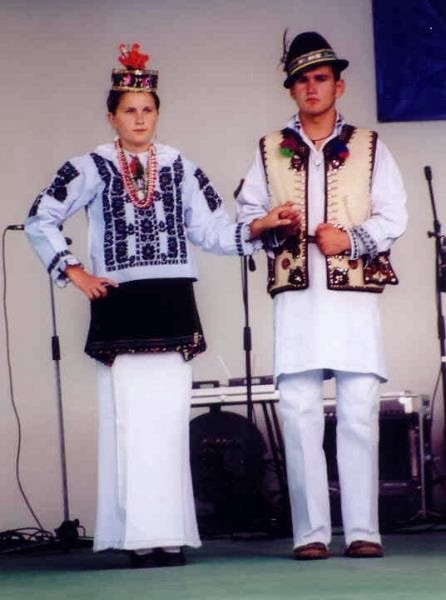 I would like to correct two mistakes (or, rather, the same one) stated about the costumes of Baranja and Banat and how the Serbs there dress (more or less?) 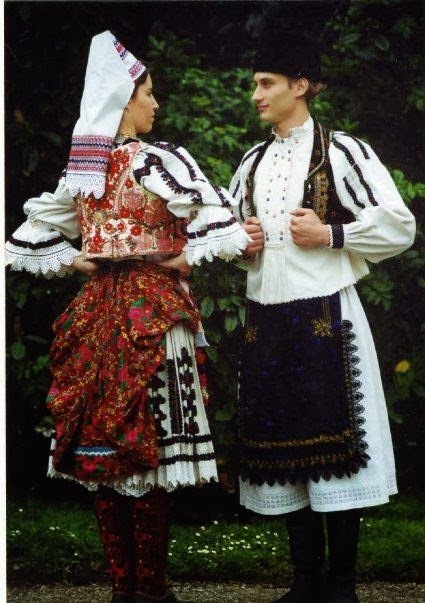 like the Croats. 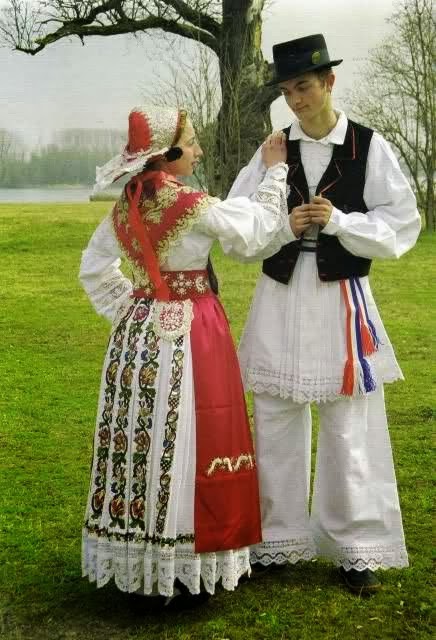 This, in fact, is not true certainly of Baranja (the Serbs there have a distinctly different costume, very similar (same type) as the Serbian costumes of Banat), and as for the Banat Croats and Serbs, I've never seen them wear, not "practically the same", but even remotely similar costumes and consider the information you have highly unlikely. 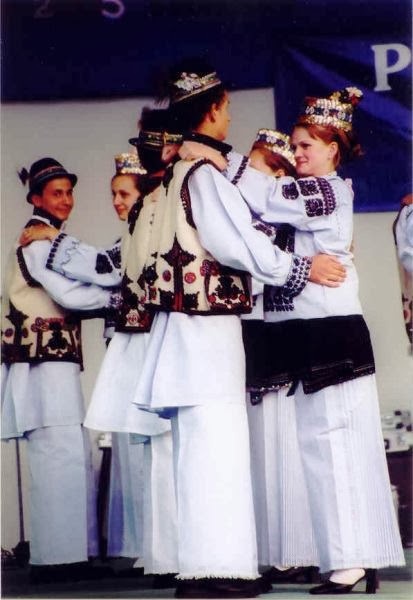 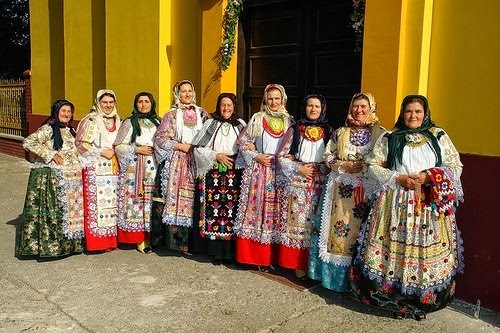 Here you can see the Serbian costumes, very similar to the ones from Banat in the video you've linked (https://www.youtube.com/watch?v=4LG2gJgsqV0), of which I must say that these are exclusively Serbian costumes. 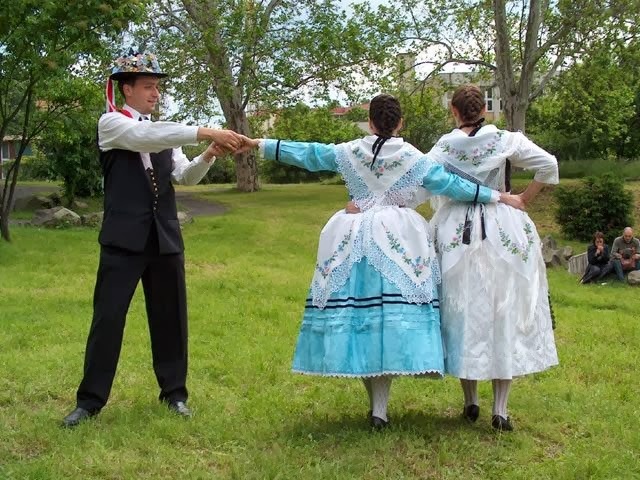 Perhaps you concluded wrongly seeing how it is performed by Lado? 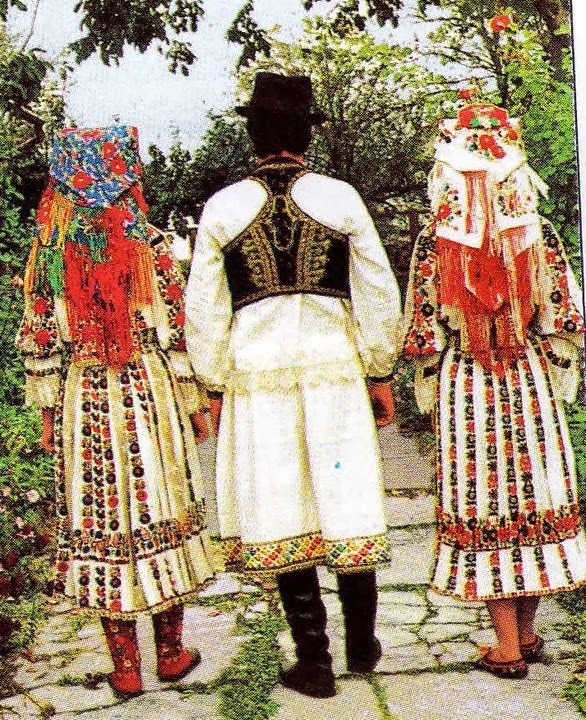 Title says 1986; well, it was certainly performed in Yugoslavia, and back then it was common, to say the least, for folk ansambles to perform songs and dances of entire Yugoslavia.